Storage unit in 12 mm. thick silver-plated extralight glass, chamfered and glued at 45°, with a shiny frame that juts out both forwards and backwards. The interior is in opaque charcoal lacquered wood with shelves in smoked glass or, on request, with a coat hanger bar. 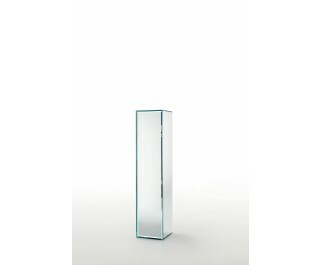 The door, made of double-faced chamfered mirror, has a push-pull opening system and it can be assembled on both sides.